I covered a day at the 6th Annual Biodiesel Fuel Convention on Feb. 3, for an upcoming issue of BABW, and got to meet Melissa Etheridge, who has become a major spokeswoman for the alternative fuel, which converts natural energy sources such as vegetable and soybean oils into fuel. They also help reduce our dependence on foreign oil, and improve the air quality, not to mention a host of other benefits. Melissa traded in her fancy cars for biodiesel vehicles, and her tour buses use biodiesel as well. Her moving speech and singing at the General Session were truly unforgettable. Having Trouble Focusing When You Write? I hope you enjoy this special issue of my February e-news, which has a theme of...you guessed it...love. Every (almost) article has to do with love in some way, and I hope that in honor of this special day, you have much love in your professional and personal lives. It's always ourselves we find at the sea..."
I think we can say much the same about Valentine's Day. Annie Gleason is the West Coast's mid-life dating coach specialist. After coaching part time for four years, she launched Get A Love Life and began coaching full-time two years ago. She is the Dating Examiner for San Francisco Examiner.com dating expert for Fifty+Fabulous, and the author of "Ask Annie" at www.getalovelife.net. She speaks about dating at various singles events, KGO/ABC-TV's The View From the Bay, where she was featured in January, as well as many other venues. Gleason studied dating coaching with Susan Bradley, RN, who is one of the founders of dating coaching. Carrie: What do you think is the biggest myth both men and women share about dating, and relationships for that matter? Annie: That you can tell if someone is right for you just by looking or by having a short conversation. You might be able to tell if someone is absolutely not a match. But if you find them interesting, you don't know if they will turn into a friend or a lover. Chemistry is not always apparent immediately, and physical attraction often grows with time. Instant attraction typically results in quick disconnection. Carrie: What is your suggestion for a good first date activity, and if it involves eating out or having a drink or coffee, is it still considered old-fashioned for the woman to expect the man to pay? *You can use it free for a 30 second slide show video, which allows you about 10 photos, which isn't much. For $30 a year, get the unlimited length, which allows you a lot more photos. *Organize your photos in a folder on your desktop ahead of time - this will help you save time on the downloads, as you can select multiple images at once. *If you have a YouTube channel like I do, this program totally rocks, since you can do automatic uploads, and it even picks up any descriptive copy you may have ingeniously thought up. *You can select from a wide variety of musical styles and artists that have been AUTHORIZED as OK to download. This will help keep you from getting into trouble with YouTube by downloading songs you don't have permission for, which is a definite no-no. 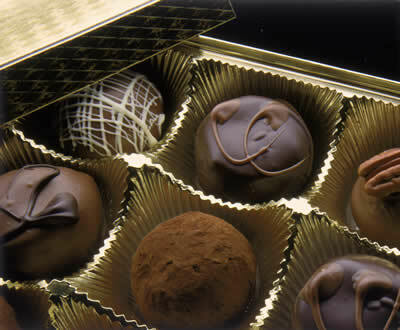 What's Valentine's Day Without Chocolates? Not So Fun. People and/or Subscribe to CarrieWriterBlog.com, and Everyone on My Active Subscribers List by March 15 Will Be Entered to Win a Free Box of Delicious Mixed Organic Chocolates by One of My Favorite Chocolate Companies. Good luck! This email was sent to carrie@carriefreelance.com by carrie@carriefreelance.com.